A surreal cycle detour, in the depths of the largest shopping mall of the Netherlands, through the underground warehouse area that is normally closed to the public. The city of Utrecht had to be very resourceful to make it possible to cycle on during the major reconstruction works that are still going on in its station area. The detour is ingenious and at the same time a testament that cycling really is very important in Utrecht. 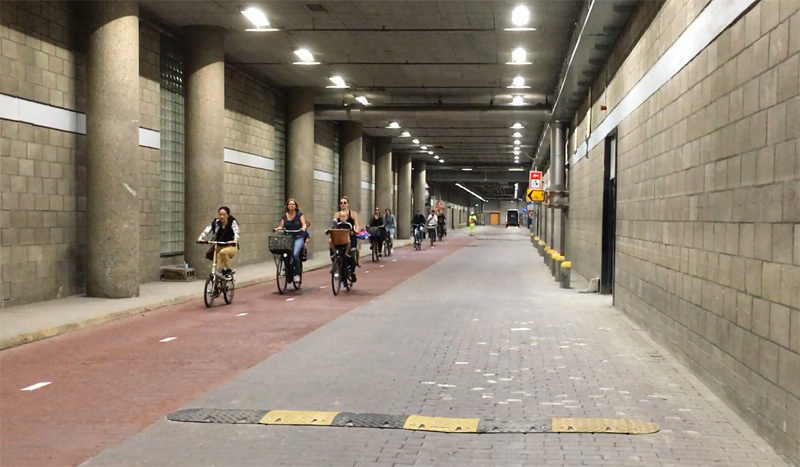 An ingenious cycle detour in Utrecht leading through the surreal environment of the underground warehouse area of the city’s shopping mall. The former overpass of the shopping mall, here over the street with the cycle route, is currently being demolished. Understandably, nobody is allowed to walk or cycle under the structure that is coming down. 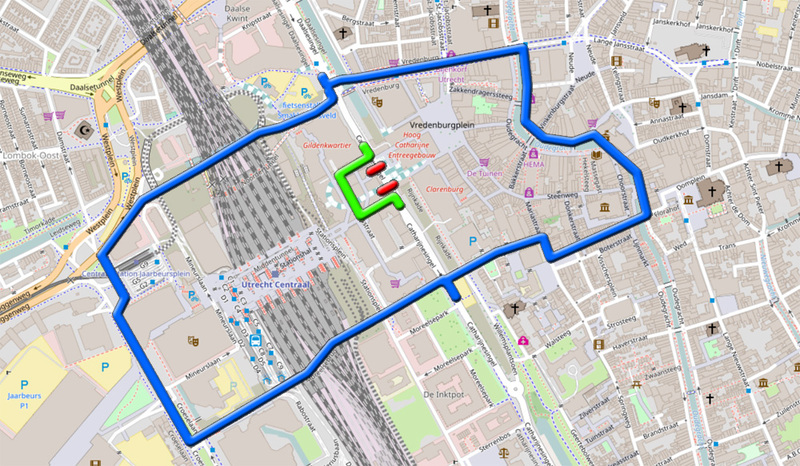 It is not the first time a cycle detour leads people through a building in the Netherlands, Amsterdam had that scoop, but that doesn’t make this – much longer – detour in Utrecht less impressive. 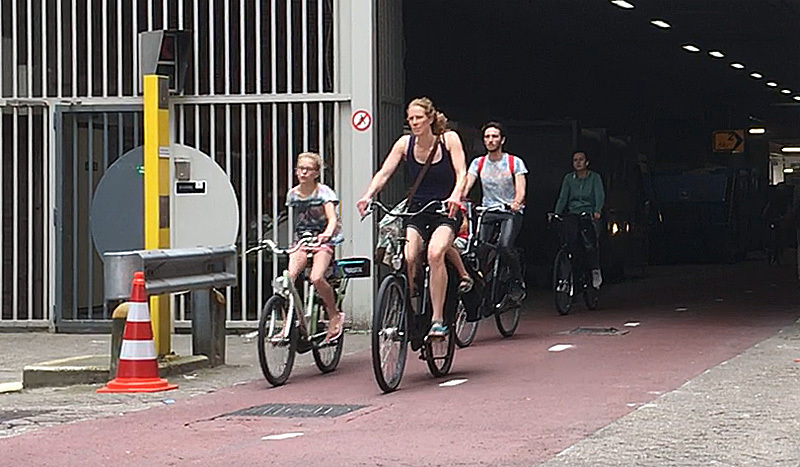 The people in Utrecht have had to adapt to so many cycle detours in the past 10 years, that they don’t blink an eye when they’re sent through the underbelly of their shopping mall, right past warehouses and waste container collection points. This area really is at street level, but since the former ordinary streets are completely covered, you have the feeling you are deep underground. The street names give away that this indeed used to be normal streets before the shopping mall was constructed in the early seventies. 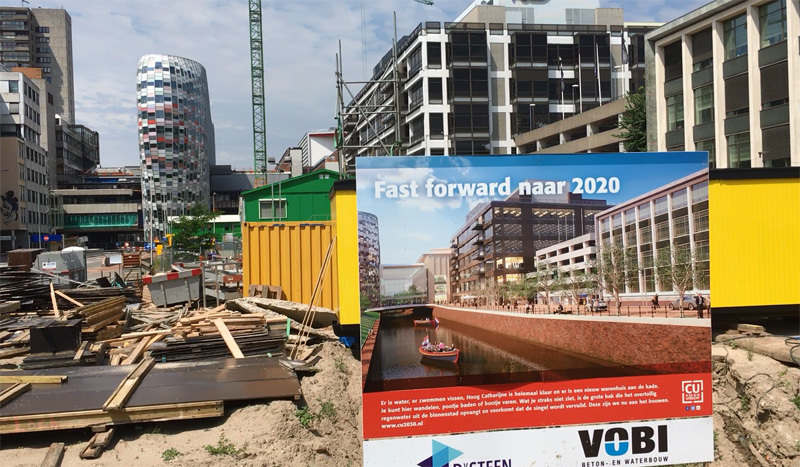 The detour leads through Westerstraat, Stationsdwarsstraat and Stationsstraat of which every building was demolished and replaced by the gigantic concrete monster that is the Hoog Catharijne shopping mall. (The monster you learn to hate and love when you find out it was the economic salvation of the small provincial town that Utrecht used to be.) At first, people could still enter this netherworld, but when the heroin addicts of the 1980s slept here by the dozens the area was sealed off with big gates and nobody was allowed to enter it any longer. Now this realm of the delivery vehicles was opened for six weeks to make cycling possible here. 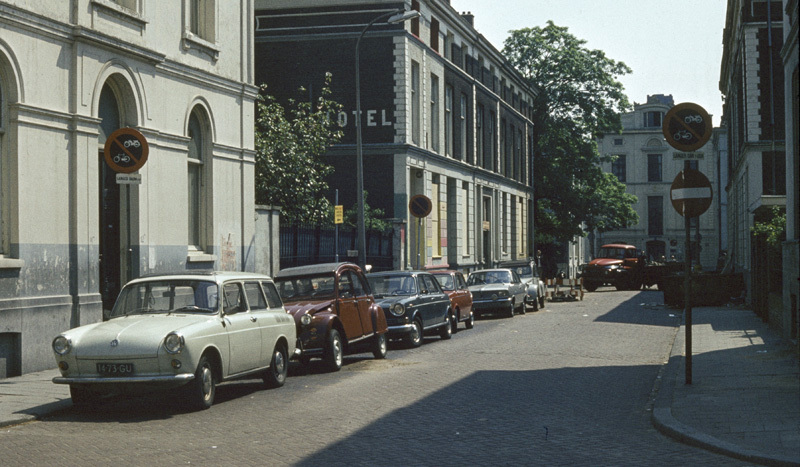 This picture of the 1960s shows the Stationsdwarsstraat when it was still a normal street. It is hard to believe that the same street looks like this today. It has been like this since the early 1970s. The red paint was put there temporarily, only for the detour. The speed bumps – to slow delivery vehicles down – were shoved to one side for the time being. The shopping mall right next to Utrecht’s central railway station is under a complete reconstruction. While it stays open, every part of it is torn down and replaced by something new. The shopping mall passed over the motorway that had come in the place of the Utrecht city moat. That overpass has also been replaced. The motorway is already gone and partly replaced by the original water. The new overpass, next to the old one and over the new water, has been built and is already open. Now that old overpass can be taken down. This is happening in the six weeks from 6 July to 21 August 2017. 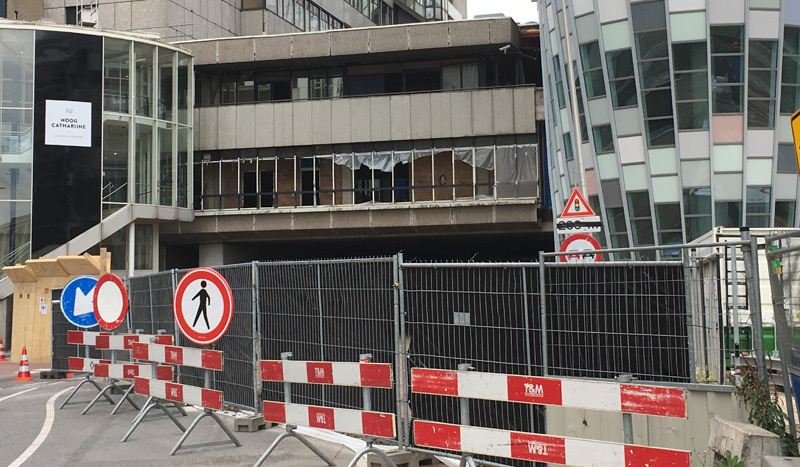 It is not possible to cycle under a structure that is being demolished, especially one where asbestos must be removed, therefore a detour was necessary. A map of the closure and the cycle detour (OpenStreetMap with my addition). The closed area (between the two red lines) is about 100 metres long. The detour is about 230 metres long. The two closest possible alternative cycle routes are quite a detour. That is because on the west side the railway tracks form a barrier and on the east side you are not allowed to cycle through the pedestrianised streets. These detours would be 1.62 km (west) and 1.35 km (east) respectively and the west detour would also involve stairs on the new Moreelsebrug. The detours for motorised traffic are really long. There is no shorter route than the one through the maze of the old city centre, which is 5.5 kilometres long, but that route is not advisable if you do not know the area really well. It will also take at least 17 minutes. 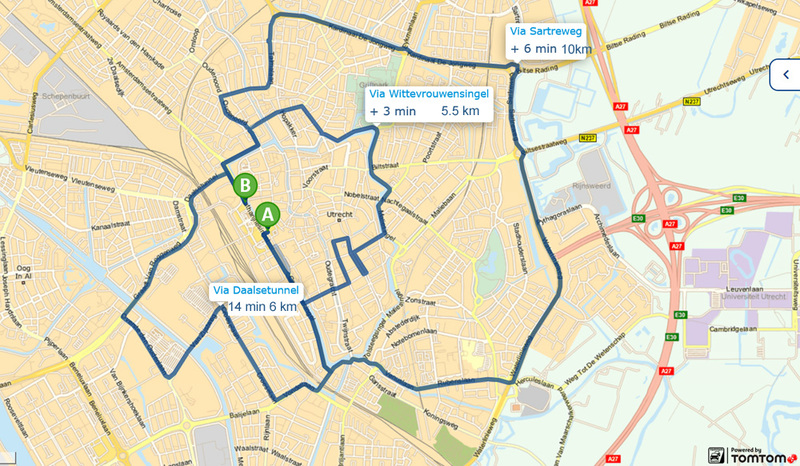 The quicker and the more sensible route is the 6 kilometres (14 minutes) west route. Alternatively you could take the 10 kilometres (20 minutes) long east route. These routes can only be taken from point A to B. Would you like to go the other way it is a completely different picture. That is because of all the one-way streets and turning restrictions. That the routes are so long clearly shows you how restricted the movements of private motor traffic are in the city centre of Utrecht. You can get into the city from all directions, but it is virtually impossible to go through that centre from one part to the other. There is no short detour for private motor traffic. The fastest route to drive to the other side (a distance of about 100 metres) is a 6-kilometre detour to the west. This takes 14 minutes. 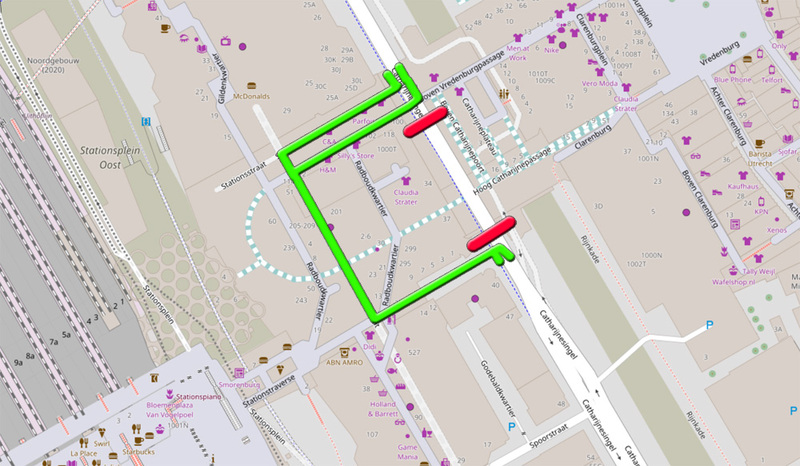 There is a slightly shorter route through the labyrinth of closed-off and one-way historic city centre streets, but that will take longer and the risk of encountering a temporary blockage (due to a delivery van for instance), which will increase your travel time even more, is really big. The third option, to the east, is going all the way to the inner ring road. This is a 10-kilometre route that takes 20 minutes. Pedestrians are sent through the shopping mall and cycling takes place in the warehouse corridors. That means that for cycling the detour is just 230 metres, only 130 metres longer than usual. The tunnels got extra lights and traffic wardens stand at every corner, 24/7, to increase the feeling of social safety. All this to make it possible for people to continue cycling in a building site. When you compare the detours for private motor traffic and cycling it is once again clear that the “cycling comes first” motto in Utrecht is no hollow phrase. When the city was still constructed for the needs of the car it looked very different. This was the motorway in the city centre (once supposed to become a full city centre ring) that had never been finished and has since been removed. Picture from 2009. The same location today shows the area is still in transition. The road is gone, but the water has not returned yet. It will take three more years of reconstruction before this area will be finally finished. 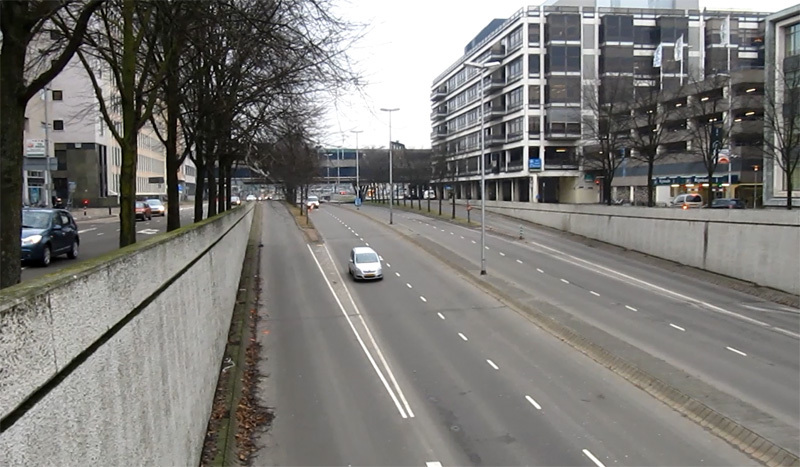 A video report on the inventive temporary cycle detour in Utrecht. Riding the detour in both directions. The already mentioned drugs users and dealers made it really to a no-go area. Although already closed for many years (in my memory since the nineties) its lugubrious reputation remained. In fact, putting gates in front of a dark hole does not really help to improve the livability at street level around such a large piece of concrete. 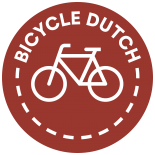 This entry was posted on 18 July 2017 by Bicycle Dutch in Original posts and tagged detour, road works, Utrecht.